Multidimensional data is captured in multiple times or depths and are normally stored in netCDF, GRIB, or HDF format. Each file contains one or multiple variables, and each variable is a multidimensional array that represents data in a given time or at a given vertical dimension. For example, a netCDF file can store temperature, humidity, and wind speed for every month from year 2010 to 2014, and at each elevation of 0, 1 meter, and 10 meters. The mosaic dataset has always been a data model for managing a collection of images and raster data. Now it has been enhanced to manage multidimensional data and provides a unified data model for working with netCDF, GRIB, and HDF formats. The netCDF raster type, GRIB raster type, and HDF raster type can be used to add data to a mosaic dataset directly without extracting any subdataset, and the mosaic datasets are multidimensional aware when created by using these raster types. You are also able to create a multidimensional mosaic dataset from nonmultidimensional data. See Multidimensional raster types for more information about these raster types. See Create a multidimensional mosaic dataset from a set of time series images for information about creating a mosaic dataset from a set of time series images. StdTime—The standardized time dimension values (UTC). StdZ—The standardized vertical dimension that is measured in length (meter). StdPressure—The standardized vertical dimension of pressure values (Pa). Dimensions—The name of the dimensions used in the mosaic dataset. The original dimension name and values may be copied to the mosaic dataset at the user's choice. 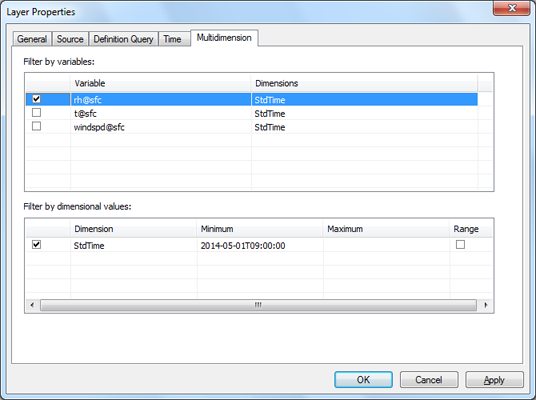 Dimensions defined in other units not on the list will be added directly without normalization. the multidimensional information can be accessed from the Multidimension tab of the Mosaic Dataset Properties. With the presence of multidimensional properties in mosaic dataset, the ArcGIS system can now better visualize and process your multidimensional data. The rasters or slices in a multidimensional mosaic dataset are usually stacked slices on top of each other. Filter which slices to visualize using the Multidimension tab on a mosaic layer, and optionally combining with the Mosaic Method from the image layer. You can filter which slices you want to work with by choosing the variables. Some of the mosaic datasets might contain multiple variables, so choose which ones you want to work with. If you want to visualize data that are related to one variable, check on that variable and click Apply. Now you will only be working with slices from that variable. You can filter by dimensions in two ways: filter by one slice, or filter by range. Filter by one slice—Displays one slice at a given time or a given vertical dimension value, by setting the corresponding values in the dimension filters. Filter by a range—Sets a range by specifying two values. The filtered slices are organized by the mosaic method chosen. If a mosaic dataset is created with the vector field template, such as wind or current data, it can be visualized using the Vector Field renderer. There are four ways to access a slice or set of slices of a multidimensional mosaic dataset, and use them in Geoprocessing tools. The first method to access your applicable data slices is by using the Make Mosaic Layer tool and specifying a query. For instance, use the Make Mosaic Layer tool and specify a query with the date of 1/1/2014, and use the mosaic layer output as an input to the Create Contour tool, to generate contours of the slice with the date of 1/1/2014. The second way to access your data slices is by using the Select by Dimension tool to choose the dimension you want to work with. 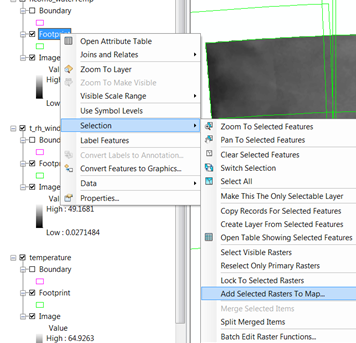 The third method to access your data slices is to make a selection within ArcMap, add the selected slices as layers of the map, then you have access to these layers for use within your geoprocessing tools. The fourth way to access your data slices is to use the corresponding ObjectID or Name fields in the mosaic dataset table. For instance, to access the first slice within a mosaic dataset, use the file path \\myServer\fgdb.gdb\temperature\objectid=1. If you are trying to calculate the minimum, maximum, or mean from a set of data slices, make the appropriate definition query, then set the mosaic dataset's mosaic operator to be minimum, maximum, or mean. Now you can export the output using the Copy Raster tool. A raster function template is an XML file that contains one of a chain of raster functions as well as the corresponding parameters. 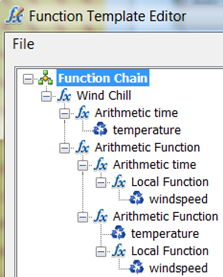 See Editing function chain templatesto learn more about function templates. A scientific formula can be represented by a raster function template. For example, a wind chill index can be calculated from temperature and wind speed. This equation can be represented as a raster function template as well. It can be added to a mosaic dataset from the Mosaic Dataset Properties page. It is located under the Processing Templates tab. Use the Browse button to add the template. 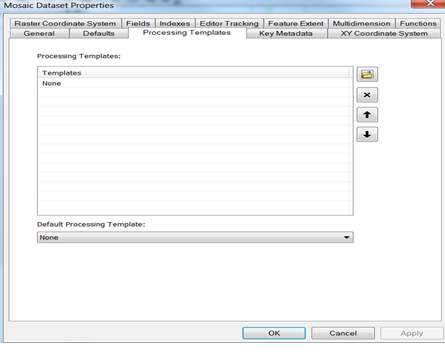 Alternatively, you can also use the Set Mosaic Dataset Properties geoprocessing tool to set the template. To access and visualize the processed result, add the mosaic dataset to ArcMap, open the Properties page of the image layer, click the Processing Template tab, then choose the processing template. It can be used as a raster function template while adding data to the mosaic dataset. The rasters slices process on-the-fly during access and display. For more information about adding rasters using a custom template, see Adding raster data to a mosaic dataset using a custom template. An image service is multidimensional if it is published from a multidimensional mosaic dataset. You have the ability to access, analyze, and display the data slices the same way you would access the slices in a multidimensional mosaic dataset. MultidimensionalInfo is an image service REST resource that can be used to obtain the dimension information to build web applications with a multidimensional service. Multidimensional image services support WMS's time and vertical dimension queries . If you intend to publish an image service that supports standard WMS Time and Elevation queries, set the fields used for time and vertical dimensions in the Mosaic Dataset Properties, before publishing the mosaic dataset. 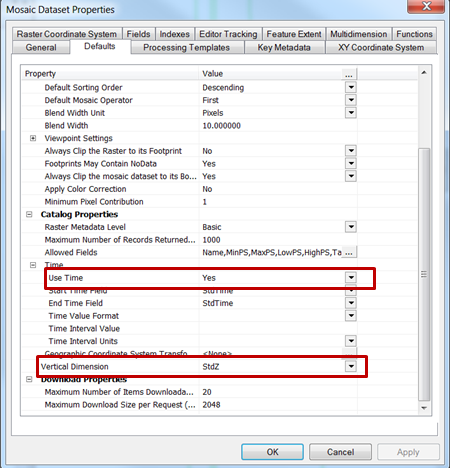 For more information about querying WMS time and vertical dimensions, see Communicating with a WMS service in a web browser.